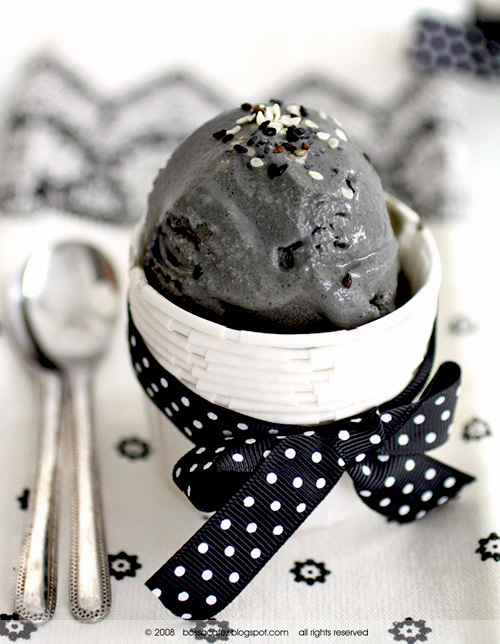 One of my favourite ice cream flavours is the simple and difficult-to-find Black Sesame. If you haven't tried sesame as a dessert then you certainly won't "get it" - I know I didn't, at first. It was the Black Sesame Iced Latte at Dotour (with its adorable little round marshmallows!) that got me going and I've been hooked since on black sesame paste, lattes, gelato and ice cream. You can buy the ice cream in shops in some cities (J-Town, T&T, Btrust and a few others in Toronto), but in most places it's tough to find - and ice cream isn't exactly importable. However, if you've got an ice cream maker at home, you can make your very own black sesame (kurogoma) ice cream using this recipe over at Evan's Kitchen Ramblings. And if black sesame isn't your thing, well, Evan has tons of recipes for Japanese sweets, and beautiful photography of all her work.